Banner. You can select the background colors, and the text and link color for the banner. If you selected template 2, 3, 4, or 5, you can alternatively select an image to create a wallpaper effect for the banner background area instead of a color. Control. You can select the background color and text color for the tree and content block toolbars. Page Tabs. For content pages, you can select the text color for the selected page tab, the text color for unselected page tabs, and the background color for all page tabs when the default round corner style page tabs are in use. When the optional square corner style page tabs are enabled, you can select both the text color and background color for the selected page tab and the unselected page tabs. You can enable square corner style page tabs for specific views using the Edit Settings functionality available in the Dashboard View Builder. For more information, see Customizing Dashboard Pages for a Public or Group View. To enable square corner tabs for all views, see How to Display Square Corner Page Tabs in All Views. Message. You can select the background color and the text color for the message. Toolbar 1 and Toolbar 2. You can select the background colors and the link colors for any custom toolbars you create. Note: Depending on the template and the items selected to be included in the view, certain items may not appear on the Custom Colors window. The following image shows the Custom Colors window containing color choices for Banner, Control, Domain, Page Tabs, and Content Block. Page Tabs Custom Color Areas. Toolbar 1 and Toolbar 2 Custom Color Areas. The Custom Colors window opens. Click the color filled rectangle adjacent to the area for which you want to select the color, such as Link, Hover, and so on. 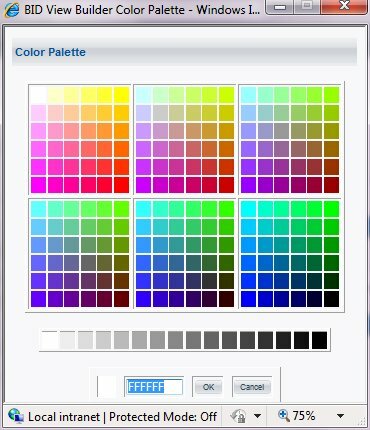 The Color Palette window opens, as shown in the following image. Click a color in the palette or enter a hex value in the input field provided. The hex value is not case-sensitive. You are not limited to the colors that appear in the Color Palette window. You can use any color you want by entering the appropriate hex value. Click OK to close the Color Palette window and save your changes. Click Close to close the Color Palette window without saving changes. You return to the Custom Colors window. Click Preview to see how the colors display. The following table lists and describes the color areas for the banner. The area that does not contain a logo or links for templates 2, 3, 4, and 5. In templates 1 and 6, it is the area behind the links. In template 1, the narrow bar above "Your Company LOGO". The area behind the links in templates 2, 3, and 4. In templates 5 and 6, the narrow bar at the bottom of the banner. In templates 1 and 3, the narrow bar below "Your Company LOGO". In template 2, the bar beneath background area 1. The logo area in templates 3, 4, and 5. Background 3 is not applicable in template 6. In template 1, the area behind "Your Company LOGO". In template 3, the line between "Your Company LOGO" and the link bar. Background 4 is not applicable for templates 2, 4, 5, and 6. In template 5, the line between "Your Company LOGO" and the message of the day. Background 5 is not applicable for templates 1, 2, 3, 4, and 6. Text color for links in the banner and for the optional welcome message. Text color for links when the cursor is positioned over the link. The following table lists and describes the color areas for the toolbar. Color of the toolbar at the top of the tree and content blocks. The following table lists and describes the color areas for page tabs. Background color for the selected page tabs. Background color for the unselected page tabs. Note: When default round corner tabs are used, the background color is the same for both selected and unselected tabs. Text color for the selected page tab. Text color for the unselected page tabs. The following table lists and describes the color areas for the message. Background color for the Message of the Day block. Color of the Message of the Day text. The following table lists and describes the color areas for toolbar 1 and toolbar 2. Toolbar background (area behind the items in the tool bar). Text color of links in the toolbar. Text color for links in the toolbar after being accessed. Text color for links in the toolbar when the cursor is positioned over the link. You can add a wallpaper effect in templates 2, 4, and 5. Enter the location of the image in the space provided or click Browse to search for the image. Note that the image must be a GIF, JPG, or BMP file. If the image is smaller than the banner area, it is repeated to fill the area. Note: Dragging the items, including images, is not supported in View Builder. Select the Click to Set Wallpaper check box only if you are changing the image or removing the image. Click Preview to view how the image displays. The Preview window must be updated before exiting the Custom Colors window or your changes will not be saved. The selected image file is copied to the WebFOCUS directory for access while running Dashboard. If the image file is modified in its original location, you will need to reinsert the image from View Builder. It will not be automatically updated. The name of the image will not display when you reenter the View Builder. Note: After making changes to the bid-config.xml file, use the Console to clear memory cache or restart the application. Until this is done, the change is not effective.